Automatically track and report your mileage with MileIQ! We are excited to announce that MileIQ is now a TechSoup Canada donor partner! In many nonprofits, employees and volunteers do a lot of driving. They visit beneficiaries in the community, make deliveries between locations, and shuttle participants to and from programs. The process of manually logging mileage for expense reports and tax purposes can be a real drain on time and energy. MileIQ is a mobile app-based solution that automatically tracks mileage using GPS. Your drivers install the app on their smartphones and it runs in the background. A quick swipe lets them tell MileIQ whether or not to track a specific drive. The data from trackable drives is automatically and securely uploaded to MileIQ’s servers, making monitoring, analysis, and reimbursement seamless and easy. MileIQ offers eligible TechSoup Canada members up to 50 MileIQ individual subscriptions within a fiscal year at an 80 percent discount per subscription . 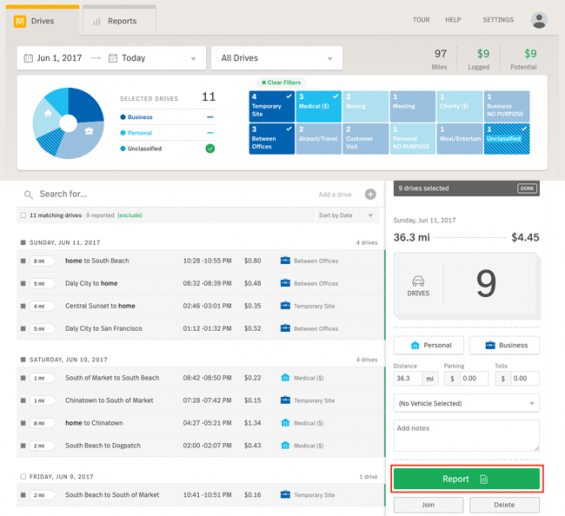 MileIQ’s web dashboard provides you insight into driver data and enables you to produce customizable reports. You can link these reports to other accounting software such as Concur and Freshbooks, ensuring complete integration with all aspects your expense management efforts. There are two ways to create a report from your MileIQ web dashboard -- either from the Drives view or the Reports view. Both ways allow to you to create custom reports based on date ranges, locations, driving categories, and drivers. To create a report from the Drives view, first select a date range. You’ll then have the option to filter drives by purpose and category using the tiles and doughnut graph. When the dashboard brings up your results, select the drives you want to include in the report by clicking the checkboxes next to those entries. Once you’ve selected the relevant drives, click Report to bring up the Report Creation menu. Here you’ll be able to name your report, have it automatically emailed to team members and/or sent to Freshbooks and Concur, and set a custom reimbursement rate. Is my organization eligible for MileIQ’s discounted products? This program is available to qualifying Canadian Registered Charities registered with the Canada Revenue Agency, Canadian nonprofits incorporated either provincially or at the federal level and Canadian public libraries with a library symbol from Library and Archives Canada For a more detailed breakdown of eligible and ineligible organizations, check out MileIQ’s program details. MileIQ is a Microsoft product, so all of Microsoft’s eligibility requirements apply. To see if you are eligible for MileIQ, log into your TechSoup Canada Account, click on the “My Organization” tab and check your eligibility status for MileIQ. How many discounted MileIQ subscriptions can I request? If your organization is eligible for the MileIQ offer, you can request up to 50 MileIQ subscriptions within a fiscal year (July 1 to June 30). See MileIQ’s program details for more information about eligibility and order cycles. Not registered with TechSoup Canada, but think you may be eligible for donations and discounts of MileIQ? The first step is to register with TechSoup Canada — it’s free and simple. Once we have processed your registration, we will let you know if you qualify for MileIQ. Registering with us also grants you access to discounts and donations from up to 30 other donor partners, which includes popular software like office productivity suites, graphic design software, accounting packages and security programs. Find out how the donations program can work for an organization like yours!